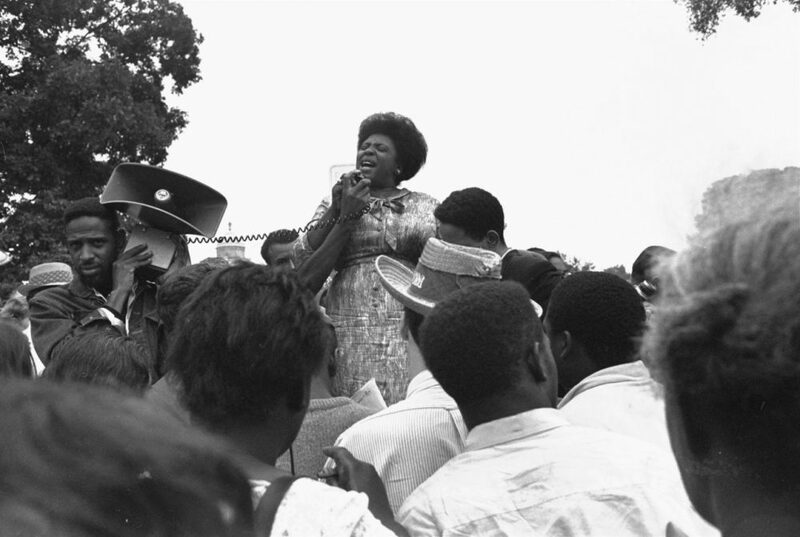 Fannie Lou Hamer is often called the spirit of the Civil Rights movement, who used singing to reflect her belief that the civil rights struggle was a spiritual one. Hamer ran for elective office three times, helped launch the Head Start preschool program and she co-founded the National Women's Political Caucus. Her soulful singing were often songs handed down to her from her mother, a sharecropper. Roxbury artist Ekua Holmes brings Fannie Lou Hamer to light in a new picture book, "Voice of Freedom: Fannie Lou Hamer, Spirit of the Civil Rights Movement." The book was awarded a Caldecott Honor this month. Ekua Holmes, Roxbury artist and illustrator of "Voice of Freedom: Fannie Lou Hamer, Spirit of the Civil Rights Movement." Assistant director and community coordinator for sparc! The Artmobile at MassArt. She created the 2015 Martin Luther King Day "Google Doodle." "This week, Roxbury artist Ekua Holmes’ first children’s book, 'Voice of Freedom: Fannie Lou Hamer, Spirit of the Civil Rights Movement' won a Caldecott Honor as a runner up to the Caldecott Medal, the top prize for children’s picture books in the country." "'I question America' — the famous words spoken by civil rights activist Fannie Lou Hamer fifty years ago this week at the tumultuous Democratic Party convention in Atlantic City — is a fitting reflection of the soul-searching that the country is once again going through in the wake of the turmoil in Ferguson, Missouri." "There was a voice during the civil rights movement of the 1960s that soothed and inspired those who marched on Southern streets and tried to sit at segregated lunch counters." This segment aired on January 29, 2016.